Sometimes, the solution to a complex problem is right in front of your nose: Clouds could be key to slowing down climate change. As the global climate passes troubling milestone after even-more-troubling milestone, some claim that humanity will have to re-engineer the environment in order to save billions of lives. The idea for cooling the planet by hacking the clouds has been around since 1974, when climatologist Mikhail Budyko first suggested trying to make clouds more reflective. Preventing the sun’s rays from reaching Earth’s surface, the reasoning goes, would keep it from absorbing heat, and could slow rapid warming. Would-be geoengineers are taking a cue from the 1991 eruption of Mount Pinatubo, which, cooled the planet by about 0.5 degrees Fahrenheit for the next two years. 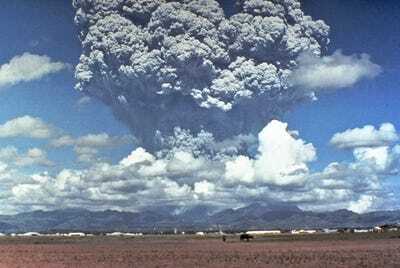 Volcanic eruptions spew hundreds of megatons of gas, including sulphur dioxide and hydrogen sulfide, into the atmosphere. Sulphur is particularly good at deflecting light, so sulfates like these (and sulfuric acid) are usually seen as our best bet for the method, also known as solar radiation management. 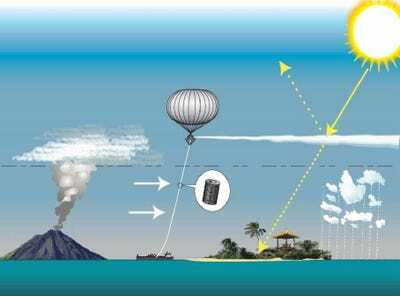 In 2011, British research collaboration Stratospheric Particle Injection for Climate Engineering (SPICE) planned on releasing fine spray of water into the atmosphere. The experiment was seen as a first step in testing whether their proposed technology — which involved a gigantic balloon tethered to a ship by a half-mile-long garden hose — would actually work. But before SPICE even got off the ground, it was canceled due to concerns about potential conflicts of interest in the research group. Environmental groups tend to be sceptical of solar-radiation management: The optics of spraying sulfates (including sulfuric acid) into the atmosphere are a huge hurdle, and we don’t actually know how safe that would be for people on the ground. An editorial in the scientific journal Nature also pointed out that right now, there isn’t a governing body or set of research standards to guide geoengineering tests, which means irresponsible researchers could unintentionally wreak havoc on planet’s climate with widespread global effects. Research groups, including SPICE and Switzerland’s CERN lab, continue to study possible solar radiation management techniques in a laboratory setting.